The Digital Demand™ is a "per use" software package. Learn more about pricing and payment options here. What do Paralegals Think DD? The average traditional demand costs between $150 - $200 to create. Copies, tabs, dividers, and employee time combine to make the demand process more expensive than need be. Using our pay pick your price model, your firm can easily choose how many demand credits to purchase at one time based on your needs. The more demands you use the more you save. By including documents, reports, video, animations, and audio into your Digital Demand™, you can be a better advocate and present a stronger case early in the process. Special pricing available for legal association members. Digital Demand™s go the extra step in presenting all of your important information quickly and succinctly. Creating a Digital Demand™ is extremely easy. Once your documents, audio statements, videos, maps, reports, and other information are ready, compiling them into a custom demand package is accomplished in a matter of minutes. Using the program takes very little training. By presenting information that appeals to the left and right brain, your demand will be more effective and understandable to all parties. Meet your personal goals or insurance company goals for go paperless office practices. 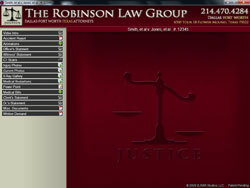 The Demand Package comes with a free basic viewer template that displays the name of your firm. To get maximum impact from your demands order the Starter Kit today. It includes a customized viewer with your logo, firm colors, and name.